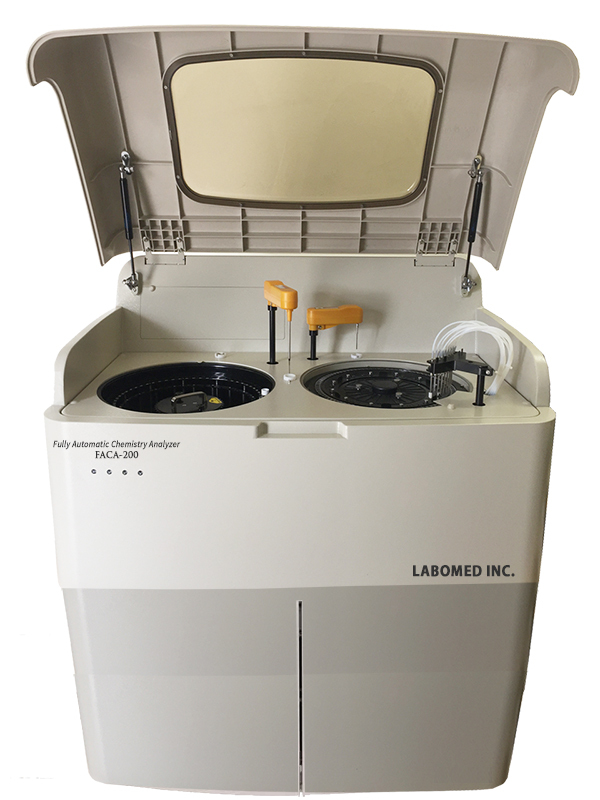 Labomed introduces an automatic chemistry analyzer with varying testing capacities. Type: Fully Automated, Random Access Biochemistry Analyzer. Throughput: 200 tests, up to 320 tests/hr with ISE (optional). Test Mode: End point, Kinetics, Fixed Time, lmmunoturbidimetry, Monochromatic, Bi-chromatic and Multi-Standard Analysis, Linearity and Nonlinearity Calibration, Single and Dual Reagents can be used. Test Setting: Programmable for single-parameter, multi-parameter, combined parameter, batch test. 1 parameters and calculation parameters. Sample Tray: 44 sample positions for primary tubes, test tubes and various sample cups, Whole sample tray is removable and replaceable. Any position can be aligned as the emergency test position. Sample Volume: 3 µL – 30 µL, programmed by 0.1 µL step. Sample Handling: Dilute and retest automatically when the sample' s concentration is beyond limitation. 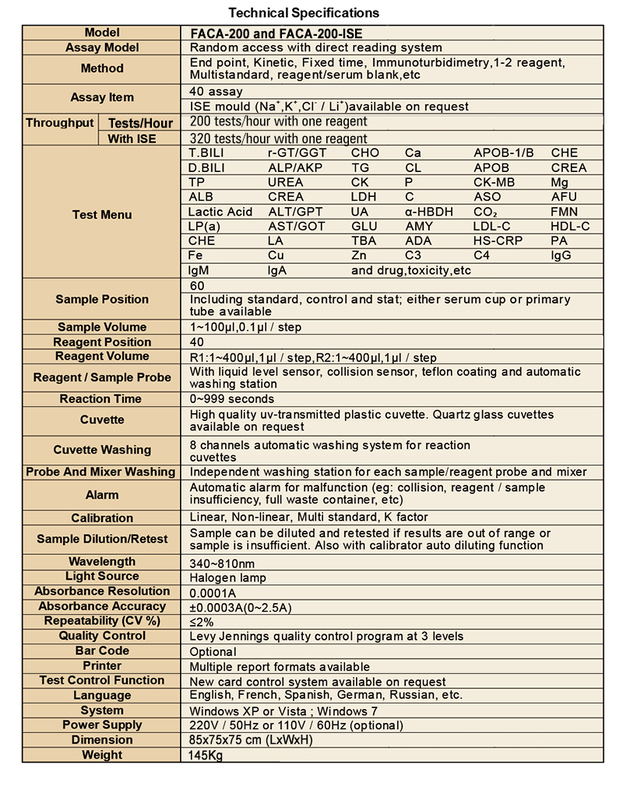 Sample Probe: Liquid level detection and collision protection. Probe cleaning: Automatic washing for both inside and outside, carry over <0.1%. Syringe: High performance syringe, durable and maintenance free. Optional item: Bar code reader. Reagent Tray: 44 positions for Single and Dual reagents, reagent positions can be aligned freely. Refrigeration: Refrigerated reagent compartment, 24 hours non-stop cooling with Peltier element to maintain temperature 4-15 ℃. Reagent Bottle Volume: 45ml and 15ml, Slope bottom design. Reagent volume: 150 µL - 300 µL, prograrnmed by 0.1µ1 step. Reagent Probe: Automatically detecting the liquid level; collision protection. Reagent pre-heating function, inventory checking. Real time monitoring of reagent residual volume and auto alarm. Probe Cleaning: Washing for both inside and outside, carry over <0. 1%. Reaction Tray: 44 reaction cuvettes with 6mm optical path, good UV penetrability, low consumable, low cost. Reaction Technology: Back – Dividing – Light – Technology. Reaction Volume: 250 µL - 300 µL. Temperature: 37℃, with +0.1℃ fluctuation. Cleaning: Supports automatic cleaning of cuvettes and allows for complete drainage to reduce carry over. Liquid Detection: Detergent, distilled water, waste liquid automatic detection and alarm. Light Source: Halogen lamp 6V/ 10W, life span > 3000 hours. Absorbance Range: 0.000 Abs -3.000 Abs. Calibration Mode: Linear (one-point, two-point and rnulti-point ), Logit-Log4P, Logit-Log5P, Spline, Exponential, Polynomial, Parabola. QC Mode: Intra-day and inter-day QC. Computer: Windows 2000 System or above. Data Management: Large capacity for results and reaction curves to be displayed, saved and printed. Report: Edit and print complete reports, format editable, supports network printing.